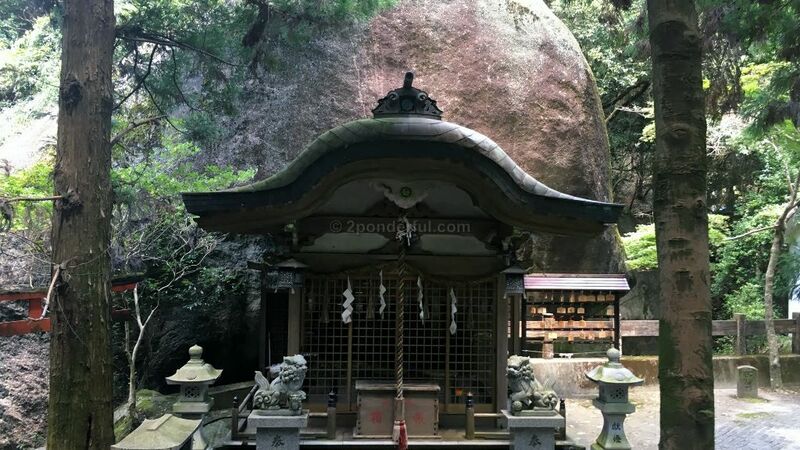 Iwafune Shrine (岩船神社） houses a huge 12 meter high and 12 meter deep rock. Japanese mythology says that “Nigihayashi no Mikoto” (the grandson of the Sun Goddess) descended from the heavens in “Ame no Iwafune” (a stone-built boat). That boat then turned into the rock. Since that time, it is said to be a guardian deity and to offer prosperity to your descendants and to safeguard your journeys. The shrine has a rocky cave. The cave is open to the general public, however, you must tour in groups of at least two people (in order to prevent accidents). After passing through the cave, visitors can see the Gate of the Celestial Rock Cave. Behind this, “Amaterasu Oomikami” (the Sun Goddess) is said to have locked herself in to mediate. Touring the cave can be considered as a kind of ascetic practice. Many practitioners of Shinto and Shugendo have visited the rocky cave to train their bodies and souls since the medieval era. : You may not be allowed to enter this sacred cave if you are wearing summer clothes such as a t-shirt and shorts. We recommend getting well prepared in advance as the inside of the rocky cave is very dark and slippy. Iwafune Shrine is a little far from the center of Osaka. It’s located in Hoshida-Enchi (Osaka prefectural nature park), so It’s also a good destination for a day hike. The walking path in Hoshida-Enchi （星田園地）is very easy on the legs and it is well signposted so it is simple to follow. At various points along the way there are alternative roads that take you to other interesting little vantage points. After coming upon a vehicle parking area, you’ll enter the park via a boardwalk. The boardwalk rises alongside the river. At the end of the path, you come across the Star of Blanco Bridge （星のブランコ） (Map-C). Crossing the bridge is a really fun experience. The bridge is 280 meters long and 50 meters high at its tallest point, making it the largest wooden foot suspension bridge in japan. After crossing the bridge, feel free to explore the various trails around the park. One of these paths takes you to Iwafune Shrine. Access : From Osaka and Kyoto: take the Keihan main line until Hirakatashi. From Hirakatashi: take the Keihan Katano line to Kisaichi. Access to Hoshida-Enchi (Map-B): from Kisaichi station (Map-A), you can follow the map to the river area, where the path is fairly obvious from there.